The projected increase in maize output this year will be key in reducing inflation rate given the significance of maize in the food inflation basket, analysts have said. The analysts were reacting to the first-round crop production estimates released by the Ministry of Agriculture, Irrigation and Water Development last week which showed a 25 percent increase in maize output. According to the estimates, maize output is expected to rise from 2.6 million metric tonnes (MT) last year to 3.3 million MT this year. Maize, as part of the food component, traditionally impacts the country’s economy given that it constitutes 45.2 percent in the Consumer Price Index (CPI), which is an aggregate basket of goods and services for computing inflation. Economics Association of Malawi (Ecama) executive director Maleka Thula said in an interview yesterday that the projected increase in maize yield could have a positive outturn on the inflation outlook in the short to medium-term. He said: “Besides the good rains, indications are that this growing season, the whole agricultural sector is expected to perform better thus this will also bolster the country’s economic activity. Meanwhile, Reserve Bank of Malawi (RBM) baseline quarterly projection model has shifted downwards to an average of 8.5 percent in 2019 from an earlier projection of 10.1 percent. RBM governor Dalitso Kabambe said in the first monetary policy committee statement though inflation expectations remain relatively high, they are likely to moderate on account of favourable prospects for macroeconomic outturn and favourable weather conditions experienced so far which point to higher agricultural output. On his part, Agricultural expert Tamani Nkhono-Mvula said increased maize output will still have an impact on inflation. “Ideally, the second and third round crop estimates give a true picture of how the country has performed in terms of food production, but looking at the trend, hopes are high the the development will still anchor inflation should the rains continue and stop at an appropriate time,” he said. Since 2016, the exchange rate has been stable. 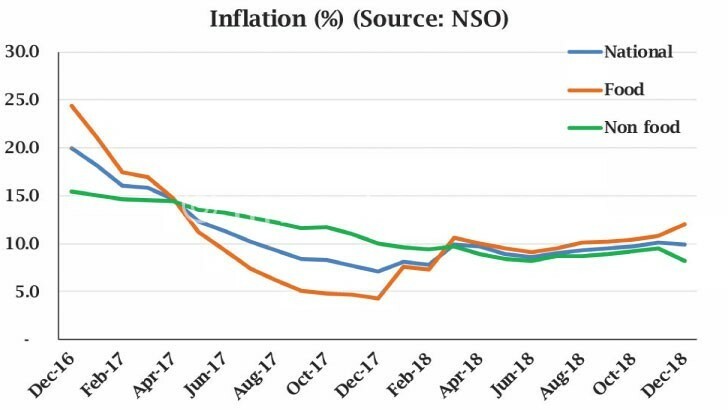 Along with this, inflation rate has also eased to 8.8 percent as of January 2019. Chancellor College economics professor Ben Kaluwa said the development may translate into positive economic outlook given that inflation plays a major role in determining the bank rate which also influences lending rates. “Maize in Malawi is a major driver of inflation. As such, the estimated maize production increase will influence food prices which are likely not rise excessively; hence, the development has a good impact on inflation prospects,” he said.